The Ryan Blaney chapter in Wood Brothers history comes to a close this weekend with the running of the season-ending Ford EcoBoost 400 at Homestead-Miami Speedway. Beginning next season, Blaney and crew chief Jeremy Bullins will return to Team Penske, and the iconic No. 21 Fusion will be driven by Paul Menard, with Greg Erwin serving as crew chief. The three “Blaney Years” have seen a resurgence in performance for NASCAR’s oldest continuously operating race team. Blaney and the Woods ran the 2015 season on a limited schedule of 16 races then returned to full-time in 2016. Their 2017 season has been a break-out year with a win at Pocono Raceway, poles and Kansas Speedway and Phoenix Raceway, four Stage wins and a nine-week run in the Monster Energy Cup playoffs. The team heads into the Ford Championship Weekend eighth in the points standings, just 10 points behind seventh-place Matt Kenseth. All told, Blaney and the No. 21 Motocraft/Quick Lane team, taking advantage of their technical alliance with Team Penske, have run 87 races together, with eight top-five and 25 top-10 finishes, 49 lead-lap finishes and 317 laps led. 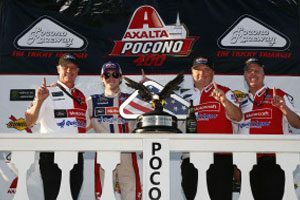 They’ve achieved several milestones for the Woods, including the team’s 99th Cup victory, at Pocono in June, its 118th pole, last week at Phoenix and its 1,500th Cup start, in September at Richmond Raceway. Team co-owner Eddie Wood said it’s been a rewarding three-year run that started as a one-year deal and grew into two more. In many ways, the Woods will keep Blaney around forever. “Just like everyone else who has ever driven for us, Ryan will always be a part of our Wood Brothers family,” Wood said. Indeed, Blaney’s image is displayed on the team’s wall of winners in the Wood Brothers Museum in Stuart, Va., and his name will be prominently displayed for posterity along with the all-star line-up of drivers who have won races and poles for the Woods. From Blaney’s perspective, he said earlier this year that he feels fortunate to have been a part of Wood Brothers history, as well as that of Team Penske. “I’ve been really lucky to drive for two great teams and get to know some great families and great people along the way,” he said in a press conference announcing his move to a third car at Team Penske. “Growing up in the sport, I looked up to teams like the Wood Brothers and the Penske organization. To drive for them is definitely something that I would always want to do as a kid. 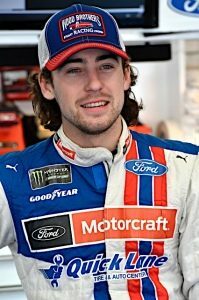 Blaney said in his post-race comments at Phoenix that he’ll give it his best shot in the Ford EcoBoost 400 at Homestead even though he won’t be among the four drivers competing for the Cup title. “It’s a shame we’re not racing for the championship, but we can still try to win the race,” he said. Qualifying for the Ford EcoBoost 400 is set for Friday at 6:15 p.m., and the race is scheduled to start just after 2:30 p.m. on Sunday with TV coverage on NBC.